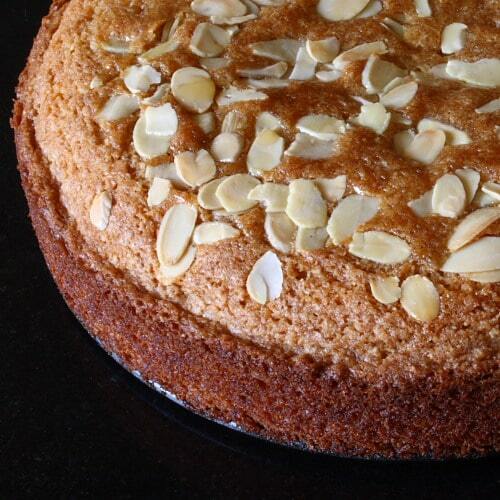 Wholemeal honey and almond cake. Easy baking, delicious cake. This has everything you’d want in a cake – it’s sweet, moist and delicious, it keeps well and it’s straightforward to make. I may go so far as to say that it’s nearly foolproof, but that I don’t want to tempt fate. Start – as you start every single cake baking adventure – by greasing a 23cm baking tin with a removable bottom with butter and lining the base with greaseproof paper. The rest of the recipe is equally unsurprising. There are a few secrets, though, and it’s these little tricks and extras that make this particular cake stand out. Weigh out 150g of wholemeal self-raising flour and mix in a teaspoon of baking powder. If you don’t have wholemeal self-raising flour, just use ordinary wholemeal flour and increase the baking powder to two teaspoons. Beat 300g of unsalted butter and 250g of golden caster sugar together until light, then beat in four medium eggs, one at a time. Add a spoonful of the wholemeal flour with each egg, to stop the mixture from splitting. Fold 150g of ground almonds into the mixture, then sift the rest of the flour over and gently fold it in, too. 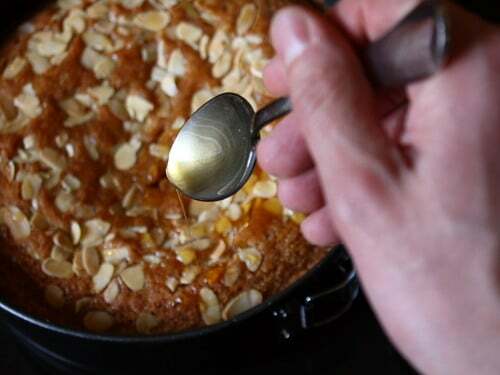 Use a spatula to help tip the mixture into the baking tin, smooth the surface and scatter the top with 50g of flaked almonds. Bake for forty-five minutes at 170c, or until a knife comes out clean when plunged into the middle of the cake. When the cake is ready, take it out of the oven and, straight away, trickle four tablespoons of runny honey evenly over the top. The honey will seep deep into the warm cake and spread throughout it, although it will pool deliciously around the centre. Spoon some more honey right over the middle, just to make sure. Allow to cool before turning out. @fionalthompson it’s made with wholemeal flour, so surely you could swing it…. Aw I love foolproof recipes :)) Seriously, this cake sounds like something I'd like to try – it looks so moist and I love that you added ground almonds into the batter. Thank you for the recipe! This looks lovely! I am going to make it this weekend for my own birthday. My husband doesn't like honey so it will be all mine! Love your blog, and your pictures are gorgeous. Katie, thanks – that's very kind. Let me know how your version goes. Sounds interesting and delicious! I am not too sure but, what is golden caster sugar? Cake is done! Of course, being the disorganised baker that I am, I had no golden caster sugar so I used half plain caster sugar and half soft light brown sugar. I also only had three eggs, so I added a splash of water to the batter. And I only had an 18 cm cake pan… do you see where this is going? You're right, the recipe is foolproof, it was quite forgiving of my changes. The cake is gorgeous and it tastes amazing. I've never had a wholemeal cake, it goes really well with the flavour of the honey. Thanks for the recipe! Excellent. Glad it worked out. Photos soon? This is really excellent to try. I’ll love to give this a go! Just finished the Leeds half marathon… Totally focussed on getting home and making this cake! Watch this… A review post is likely to be delayed due to a full mouth! I just made this beautiful and easy cake because I was bored and it is brilliant. I never thought that I can bake a very yummy cake from wholemeal flour. It is just perfect! If there's anymore recipe like this I would be happy to make. Have made this twice and both times came out different. There seems to be conflicting recipes from river cottage and hughs guardian article. One recipe says use 300gms of butter and the other says 300. This seems a tremendous amount so I used 250gms with no problem both times. Has anyone else done this. Very moist cake so wondered if it needed so much butter. Would love to know what you think..? Meant to say 350 gms! I am sure there is to much butter in this recepie, always have lots of butter run out on the tray I am cooking it on.Any normal cake dose not require this amount of butter, it always sinks badly in the middle ?. There are lots of reasons why a cake might sink in the middle – could be the temperature, under or over mixing the ingredients, opening the oven door…lots of things. I love this cake……I reduced the butter from 350g to 320g and sugar from 250g to 230g to reduce sweetness. Super recipe. Can you please make a cake whithout so much butter? this cake is awfull, how can I make this for my family? Hi Sonia, thanks for your comment. I’m sorry you don’t like the sound of this cake, and I’m really sorry that all that butter seems to make you a bit angry. I hate it when people get all worked up about butter. 1) don’t bake cakes at all. 3) make this cake, but scale back on the butter to suit your tastes. Crazy, huh? Have a great day, and happy butter-free baking. I made this cake a few years ago.It was so good but I couldn’t find what I had done with the recipe and forgot about it, until now.I am saving the recipe again and will bake it forever! I bake a lot and this really is one of my favourites.